For the Bolt family taking their 9-month-old daughter Addison to Memorial Stadium to see Clemson play was a dream they had since she was born. Unfortunately, Addison was diagnosed with Krabbe Disease, a terminal illness, and they feared their dream would never come true. According to ESPN, a man named John Neal who runs a facebook page called Team Krabbe Strong, has made it his mission to support families impacted by Krabbe Disease. He learned about the Bolt family and heard their dream of going to a Clemson game. Now, going to the game would be impossible, so John had another idea. He would find a way to bring all of the excitement and fun of a Clemson game to them! 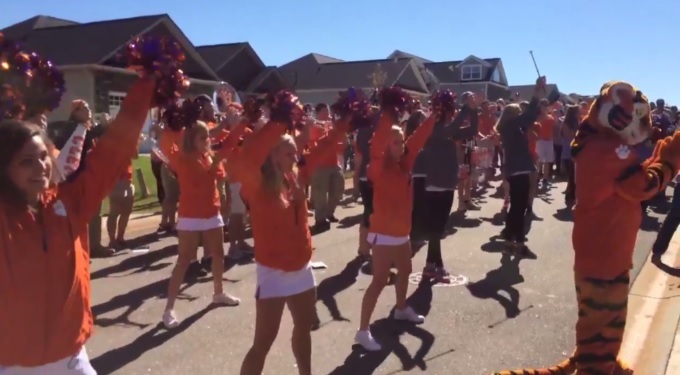 The band, cheerleaders, fans, family and friends were all bused in and they held an impromptu pep rally outside of the Bolt's home this past Sunday. Here is a clip from WYFF4-TV of the Tiger Band getting everyone fired up. Way to go Tiger Band, Clemson University and especially John Neal. What a wonderful way to help this family.